Now more than four years after it debuted back in 2009, popular crowdfunding site Kickstarter has surpassed $1 billion in pledges. The site made the announcement with a special page on its website to celebrate the benchmark. Kickstarter says the $1 billion comes from $5.7 million people and that half of which was pledged in the last 12 months alone. Kickstarter has come a long way since it launched on April 28, 2009 when it garnered a total of $1,084 for 7 projects from 40 people. On March 13, 2013, the site set its own record when 54,187 backers pledged over $4 million to nearly 2,000 projects. In total the $1 billion in pledges comes from 224 countries and territories spread around the globe, with the US, UK and Canada sitting as the top contributors. 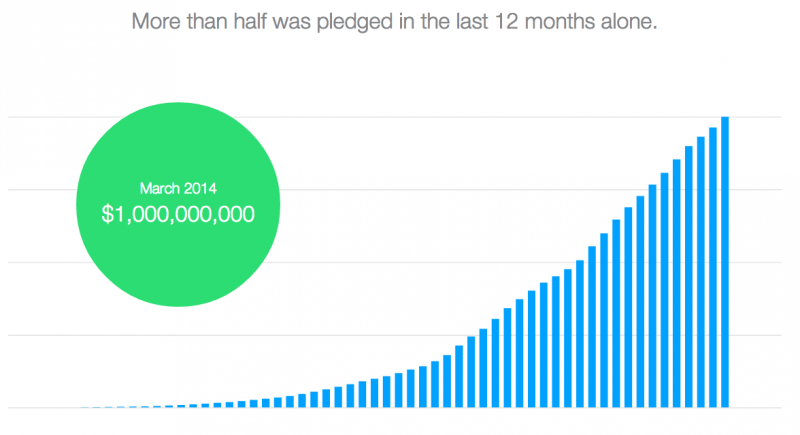 US users handed out $663 million in pledges, with those from the UK and Canada dropping $54 million and $45 million in pledges respectively. To break the numbers down a little further, almost 1.7 million people have backed more than one project with nearly 20,000 people pledging to more than 50 projects. In total, $619 million has been pledged by returning backers, around 62% of the $1 billion total according to Kickstarter.